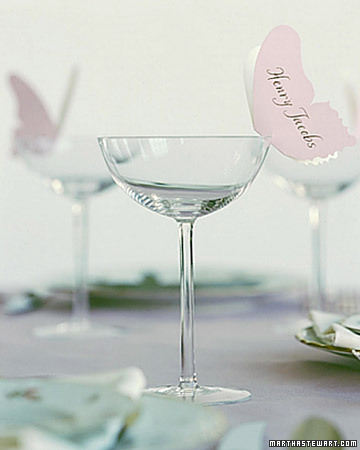 Placecards are a fun detail of the wedding reception, especially since it personalizes the party for guests and gives them something to take home to remember the lovely couple and the great time they had. If you love wine and want to incorporate that into your big fancy party, Mint can show you one way to do it! It's good ol' do-it-yourself, so if you're looking to save a few pennies - this is quite an idea! Martha Stewart Weddings has some beautiful ideas as well! They have a new DIY section where they have links to free templates, clip art, etc.